Barbie Treasure Box that is 4" x 3.75" x 4" is a round box perfect to be kept on top of the dresser to hold small treasures. 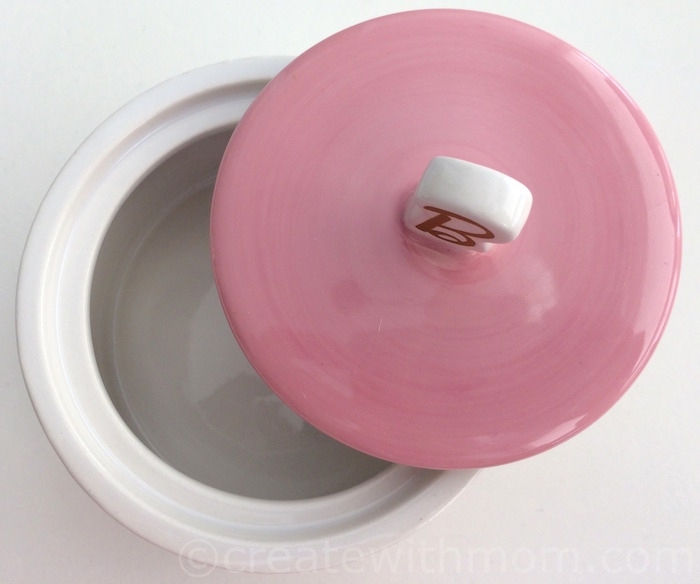 The pink lid with the signature letter B handle covers the container that has dotted, diamond design and beauty icons. Classic Barbie Profile Ceramic 12 oz. 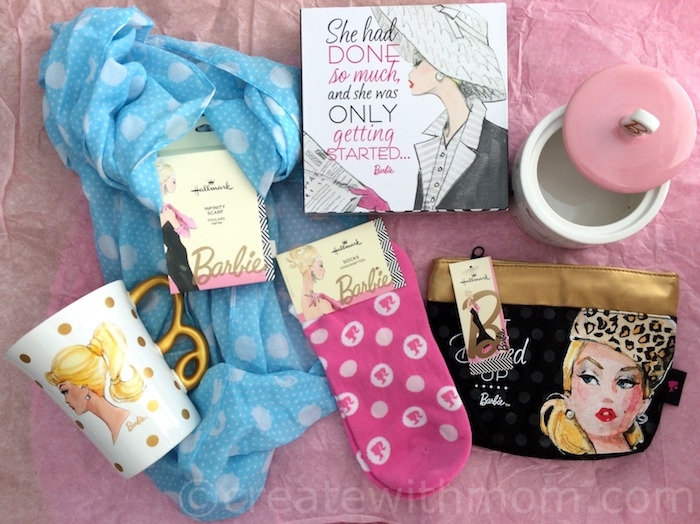 Mug has a Barbie profile image with metallic gold dots and a bright pink interior. This hand wash only mug is available in four other designs. Getting Started Plaque measures 6" x 6" x 1.25". There is a fashion sketch styled picture and a verse on it. This plaque can be mounted on the wall or kept on a shelf or table as it can stand freely. 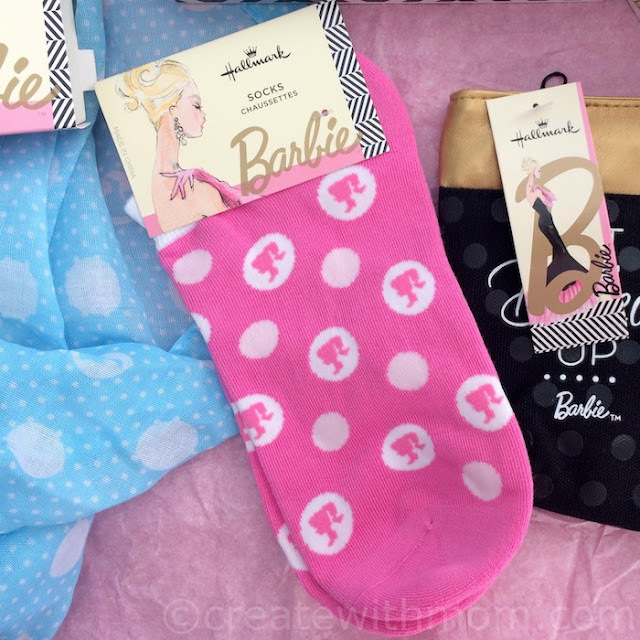 Pink Barbie silhouette Ankle Socks are dressed up with pink polka dots and the classic Barbie silhouette. Blue with white dots infinity scarf feels light and airy. The light aqua blue scarf has white polka dots with the classic Barbie silhouette and the signature letter B. This scarf is also available either in pink with black diamonds, or black with pink diamonds. Dolled Up Zippered Makeup Bag can be used to hold cosmetics. It is lined with pink fabric and has a faux-leather metallic gold top and zipper pull. 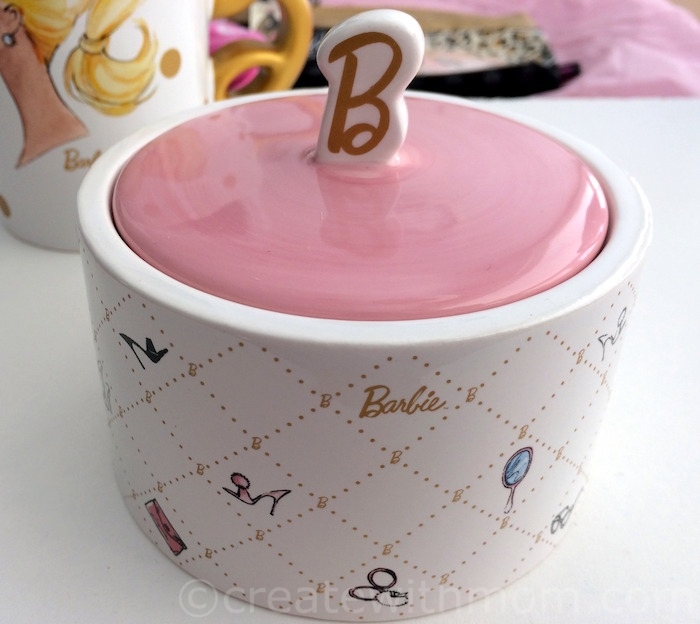 These blended vintage and modern chic design of products would be wonderful to give Barbie fans. Hallmark always impresses! For all ocassions! Cut selection of presents. Love what Hallmark does! These are great for the Barbie fan in your life! This would make a fantastic Christmas present for teenagers.